To help you add a unique look to your presents, we have created a printable Christmas tags template ready for you to print and add to your tag design..fab right? 1. Take the largest die within the First Edition Scalloped Circle Nesting Die Set and line it up along the top edge of your Dovecraft 6x6 embossed card blank. Avoid cutting the edge connecting the two sides of the card as this will allow you to make a tag that can be opened. 2. TIP Tape the die into place with a piece of Washi Tape to stop the die from slipping as it passes through the machine. 4. Die cut a piece of Dovecraft Magic and Sparkle 8x8 paper, using the second largest die from your First Edition dies set. Adhere with Dovecraft Perma Fix tape to the centre of your die cut tag. 5. Cut out the stag topper from your free template and wrap a length of Dovecraft Twine around the top. Ensure there is enough twine to attach embellishments. Add 3D foam pads to the back of your topper and adhere it to the centre of your die cut tag. 6. Die cut two of the snowflakes on to a sheet of Dovecraft Silver Glitter Card. Layer the smaller snowflake on top of the larger snowflake and tie the excess twine around both die cuts, ensuring they’re secure. 7. Thread through a Magic and Sparkle button onto your twine and then, tie a knot to secure your embellishments. Glue a selection of Magic and Sparkle sequins to your tag. 8. 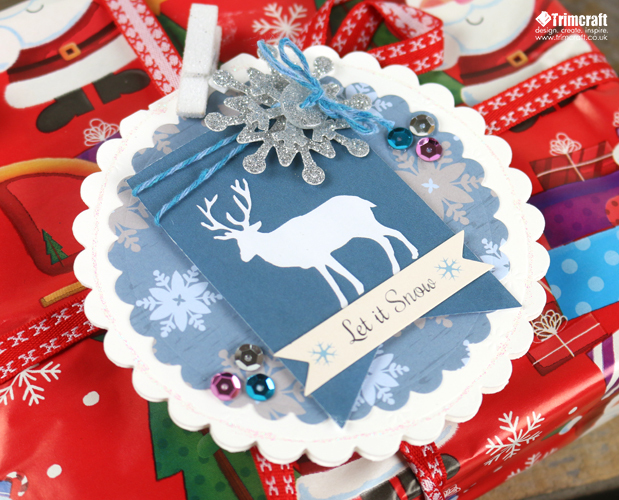 To make your tag really twinkle, add a line of Dovecraft Glitter Glue around the border. 9. Finish by adding the ‘Let it Snow’ sentiment from the Magic and Sparkle sticker sheet to the bottom of your topper. This tag is so easy to make and will be sure to make your gift sparkle underneath the fairy lights! On your free printable you will also find a variety of festive sentiments that will make a wonderful topper on your tags!